As we all know, school rankings make an important part of our decisions on various decisions such as where we live, how far away from the house should be from the school, et cetera. The common perception in our society is that money defines the quality. The question we seek to answer today is whether money is a major factor in a school’s success. We’ll look at the top 25 most elite public schools in the nation, based on the “US News Rankings ” list and see the amount of money given to each school from their district. Money is given to public schools by using a value set by the district which is based on the amount of money per student. The unit is called DCPP or the district cost per pupil. The majority of this money is taken from the taxes collected by the district, and a education usually makes up a big portion of the funds the district collects. However certain districts may put more importance to education, thus giving more DCPP. 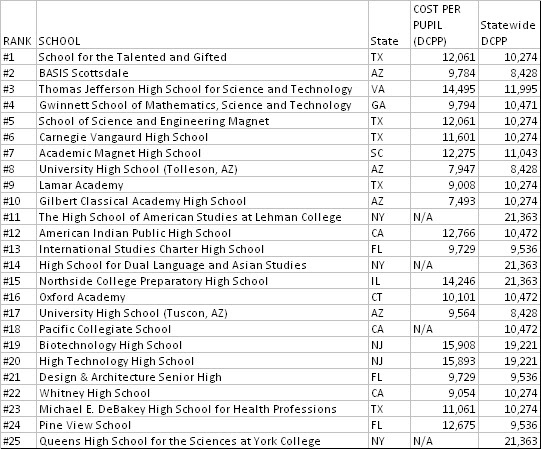 The chart I’ve compiled shows the rank of the school, it’s districts DCPP, and the state average’s DCPP. The state average is important because with this, we can tell if that district is either an anomaly in its district or near the average of it’s state. For the sake of comparison, the national average DCPP is $10700 and varies heavily from state to state to state. The District of Columbia has a DCPP of nearly $20,000, being the highest in the country. The lowest DCPP is in Utah with a cost of $6555 per pupil. The above table has the values for top 25 schools. The N/A values are to represent that the district didn’t tell its DCPP online. After I finished compiling all of the data, one pattern came to my attention. Many of the schools were in districts with higher DCPPs than their state average, yet the farther you go down the list, this pattern seems to fade. This can allow us to assume that money becomes more relevant the better the schools do in other categories such as SAT and AP averages. So is the money given to private schools a factor in its success? Without a doubt, yes! Yet, this cannot be taken too far to the extent that it’s the only factor. Many other factors must be present, such as students who are truly voracious for knowledge and teachers not just willing, but excited to teach. Money cannot act as a surrogate for the other factors that a school is judged by, but can act as a supplement to a schools ability to do more and reach just a little farther. On another note, one other pattern came to attention. Fourteen of the top twenty-five schools are from Southern states. 5 of the 25 schools were from Texas, or 20%. Another 4 out of the 25 schools were from Arizona, just under 20%. Yet none of the top 10 universities are located in these areas. It may also be noted that none of the top 10 high schools are from North East where most of elite universities and Ivy league schools are situated. Why is this? This question brings up an important point on how location may also affect a school’s success as well as a multitude of different factors.